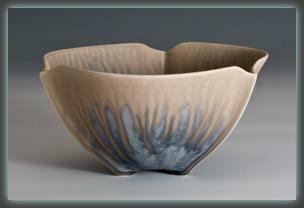 Alan and Brenda Newman have been full-time studio potters since 1978. In 1984, they relocated from New Mexico to Salem, Oregon. They are known for their functional porcelain, which combines botanic elements with sculptural forms. Over the years, they have developed flowing matted, micro-crystalline glazes, making each piece create, individually beautiful. Their award winning work is shown in galleries and museum shops throughout the country.